Firstly, Salmon Treasurer provides extended treasury management system functionality enabling you to centralise or decentralise treasury operations and manage unlimited accounts, facilities, books, funds, dealers and companies. Furthermore, by automating the majority of treasury management processes, Salmon Treasurer effectively eliminates the need for spreadsheets and allows you to focus on adding value elsewhere. The system supports all currencies, facilitates trades and managing these trades, across an extensive range of financial instruments providing real-time revaluation of all deals and positions while interfacing with a wide variety of external and internal systems. Treasurer’s in-house banking and netting modules let you optimise cash balances and positions across departments and subsidiaries. Secondly, our treasury management system is suited to single, double and triple digit user numbers and benefits a variety of business types and sizes. We work closely with our clients from the outset promising a significantly shorter integration time than competitors. Additionally, we offer comprehensive support with a focus on forging a strong working relationship. We are committed to enhancing the performance of our array of treasury management modules and continually explore trends and developments in technology and finance. We keep an eye out for new third-party products likely to be of benefit to our clients that can be adapted and integrated into our system and, as a Microsoft Developer, we benefit from having advance use of all new Microsoft products. And at last, treasurer’s in-house banking and netting modules let you optimise cash balances and positions across departments and subsidiaries and, with high-level dashboard reporting on financial exposure and risk you get timely, clear information for your short-, medium and long-term corporate risk strategies and investment decisions. Salmon Software provides a world-class treasury management system at a very affordable price. Salmon Treasurer lets you automate your deals through electronic trading platforms, automate your processing through electronic matching systems and automatically update all electronic payments on foot of deals traded. The list of automated processing systems to which Salmon Treasurer interfaces in terms of receiving and delivering data is vast. If you have a query about connecting to any system, please do not hesitate to contact us. Auto-upload of bank statements though interfaces to all major banking systems and multi-bank platforms such as SWIFT, Bottomline and Fundtech. Maintain all third-party settlement instructions in an appropriate manner and automate electronic payments processing to all major banking systems and multi-bank platforms. Execute an extensive range of OTC trades using leading independent electronic trading platforms such as 360T, FXall and Currenex. Upload orders for execution and download executed orders automatically and seamlessly. Optimise your data coverage with up-to-the-second price feeds from top data solutions providers such as Bloomberg and Thomson Reuters. Match automated messages relating to executed trades with electronic matching systems such as Misys. With e-trading and e-matching you virtually eliminate all manual processes. Produce all journal postings in respect of trading transactions, interest accruals valuations and exposures. Our system integrates with a wide range of accounting systems such as SAP, Oracle, SUN, Coda, JD Edwards, PeopleSoft, XOR and others. The role of the corporate treasurer has expanded significantly in recent years as successive financial crises, changing regulation and advances in communications and technologies have combined to alter the global financial landscape. Salmon Software’s Treasury Management System supports treasury departments in dealing with the challenges of a rapidly changing international economy. Our range of cash management and liquidity optimisation modules enables you to maintain and monitor—in real time—your positions, accounts, cashbooks and cash flow forecasts and to gain greater control in the management of your working capital, treasury positions and financial risk. Balances from any number of bank accounts are automatically uploaded for viewing individually or in groupings such as currency, division, region and business unit. Transactions information can be viewed instantly—or outputted to schedule—using familiar, standardized reconciliation procedures. Daily cash balances may be pooled physically, using zero balances and target balances, or nationally. Our system is configured to bring together a range of inputs to inform daily and longer term forecasting providing instant liquidity and cash-flow projections. Customisable cash-flow worksheets are available in a variety of formats. Our system incorporates a unique ‘scratch pad’ module that allows you to undertake hypothetical modelling and simulate transactions based on desired outcomes. Effective forecasting is key to managing liquidity while good treasury management relies to a great extent on access to timely, quality, and accurate information in determining future positions. Salmon Software greatly appreciates the challenges for the treasurer in drawing up reliable liquidity forecasts while operating in an increasingly competitive and dynamic marketplace. The Salmon Treasurer forecasting module eases the complex task of preparing treasury forecasts by providing-instantly-crucial information in helping you manage financial risk and determine the optimal financing and investment strategies to undertake. The module is suitable for businesses with multiple units and captures forecasted FX flows from multiple subsidiaries via the web. The module instantly collates data displaying it by currency, business unit, region, etc. and provides a full forecast update history. This totally secure system with multiple approval levels handles hundreds of different forecast grids instantly and even includes a facility for designing your own forecast grid. The combination of forecasting, cash flow and simulated datasets goes beyond simple working capital management to inform decisions on longer-term strategies. As well as capturing commodity trades, Salmon Treasurer also features a commodities forecasting module that enables you to forecast your commodity requirements as they relate to your business. This module can be applied to a range of commodities (oil, wheat etc.) allowing you to forecast tonnage, volumes, prices, purchases and sales while simultaneously monitoring input on cash positions. Trades in an extensive range of OTC products can be executed instantly while accessing crucial risk, exposure and hedging information. Both ON and OFF Balance Sheet instruments are catered for using our Debt and Derivatives modules. These modules are complemented by our extensive Credit Facilities Modules. In addition, our Trade Finance, Commodities and Equities Modules add further to our extensive range of Trading Modules. Monitor and manage lending over multiple interest periods with debt instruments that include Bullet Loans, Amortising Loans, Bonds (including Zero Coupon), Floating Rate Notes (FRNs), Medium Term Notes (MTNs), Guarantees, Annuities, Private Placements and Syndicated Lending. The system enables you to manage Sub-Participation on loans and Participation Fees Management. Our suite of debt management tools also includes an Aircraft Leasing Module. Record off-balance sheet items such as Interest Rate Swaps, Amortising Swaps, Uneven Swaps, Cross Currency Interest Rate Swaps, Asset-Backed Swaps, Liability Swaps, Currency Asset Swaps Swap Options (Swaptions), Caps, Collars and Floors. Manage your Credit Facilities and Monitor Usage and Availability in real time. All types of facilities are catered for including Revolving Credit lines, Multi-Currency Drawdowns, Group Facilities, Overdrafts etc.). We have full Fees Management including Commitment Fees, Utilisation Fees, Arrangement Fees, Agency Fees, Management Fees, Custody Fees, Participation Fees, Fronting Fees and Guarantee Fees. Manage (International) Trade Finance instruments such as Letters of Credit, Letters of Comfort, Letters of Guarantee, Letters of Support, Letters of Tender and Bid Bonds. The combination of forecasting cash flow and simulated datasets goes beyond simple working capital management to inform decisions on longer-term strategies. – Manage Coupons, Coupon Adjustments, Redemption and Dividends. – Calculate profits and losses according to FIFO, LIFO and Weighted Averages as required. Our sophisticated TMS supports cross-asset trading while interfacing with leading technologies from 360T, FX ALL, Currenex, Bloomberg and Thomson Reuters. eTraded Deals are recorded automatically and immediately, in Salmon Treasurer, upon execution on the eTrading Platform. Manually entered Deals are entered using the minimum selections and keystrokes with context-sensitive default input and dialogue boxes throughout. For frequently performed deals, templates or wizards can be set up with pre-coded default details. Maturity dates and settlement amounts are automatically calculated while default pay/receive instructions and journal entries are automatically produced. A key feature is that the system will immediately, in real time, notify a user if a Deal is executed or settled on a non-trading day using our unique, in-built, perpetual algorithmic business calendar which monitors all good business days and automatically adjusts settlements dates accordingly. Manage your short term money market activity directly with counterparties by phone or on eTrading platforms using all variations of short term instruments including Short Term Fixed Deposits, Guarantees, Commercial Paper, Discounts, Government Treasury Bills, Discounted and Interest Bearing Commercial Paper. The Money Markets Module facilitates a comprehensive set of Rollover Activity including, One To One, One To Many and Many To Many Rollovers. Off balance sheet instruments such as the Forward Rate Agreement (FRAs) are also catered for. Hedge your exposure with a comprehensive set of foreign exchange management modules. These modules are complemented with real-time links to external rates feeds and eTrading platforms. Our FX modules cover a range of instruments that includes Spots, Forward Contracts, Even Swaps, Uneven Swaps, Non-Deliverable Forwards, Contract Rolling, Call Options, Put Options, Collars and Caps. They also facilitate Partial Contract Usage, Contract Rollovers, Contract Closing and Contract Net Settlement. With Salmon Treasurer you can operate as a bank to your subsidiaries and greatly facilitate the efficient movement of cash and non-cash items to and from entities and between entities themselves. With its highly-automated processing capability, Salmon Treasurer enables you collect and collate your ZBAs and apply them to your inter-company positions in real time while also enabling you to aggregate liquidity and maintain individual and global currency positions. Salmon Treasurer provides the data to inform your risk strategies and the processing power to generate greater efficiencies for your department through optimised cash flow and FX management. The system enables fully-automated net settlement through multiple accounts with invoice acceptance and approval processing and an in-built process for resolving disputed invoices. The system facilitates subsidiary deal ordering and effective working capital management by permitting subsidiaries to order and deliver funding to the in-house bank via their inter-company positions. Inter-company statements and inter-company interest data are immediately available while inter-company statements are automatically emailed to relevant parties. Treasurers are playing an increasingly strategic role, as up-to-the-minute treasury reporting becomes a crucial component in the organisation’s investment choices, risk management decisions and forecasting processes. Increased scrutiny of businesses both internally and externally has highlighted the role of treasurer as communicator to a diverse stakeholder base that may include senior management, employees, shareholders, investors, regulators, auditors, banks and business partners. 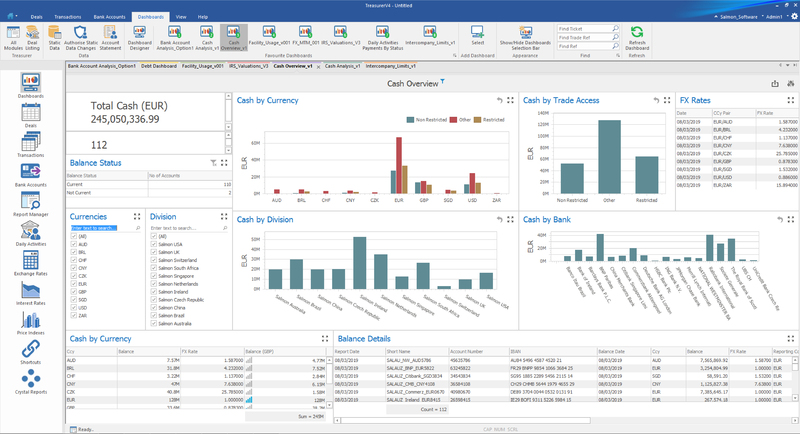 Salmon Treasurer’s extensive reporting capabilities supports the task of the treasurer in providing instant visibility on, Cash, Exposures, Positions, Valuations, Financing, Liquidity and Risk in a variety of formats including dashboards. We have our own Salmon Treasurer library of financial functions ensuring an extremely versatile reporting output allowing for multiple combinations and choices of groupings criteria such as Currencies, Regions and Business Sectors. Manage cash and liquidity exposure through effective identification and monitoring of multi-currency cash positions across all departments and subsidiaries. Monitor and maintain counterparty limits in real time. This includes real-time advices via email on limits breaches or near breaches. Evaluate open and closed positions and create mark-to-market realised and unrealised gains and losses. Monitor, quantify and evaluate exposure to interest rate movements across a variety of instruments including debt and swaps. Value individual instruments and group positions using live rates. Create different hedge types and monitor your hedging against your organisation’s hedging policies.